The following class comments are quotes taken from written class evaluations. Lots of good ideas! I’m really motivated to get paper organized, other things too but paper is a major problem. Most helpful are the ideas to build good habits and disciplines to battle paper management. So glad I came to this class – great information. Janine was very engaging and answered questions. Great handout. Presentation was well delivered. Helped organize my mind on how to go about de-cluttering. Janine was great and explained things very clearly and simply. I thought that the class was going to intimidate me, but I felt very comfortable. Really made me think of ways to improve my skills. I would definitely recommend this class. Janine spoke at just the right pace for us to keep up our notes; simplified what so many of us would consider not attainable. Has lots of examples to make her point. She didn’t just talk ‘terms and definitions’. It was very organized and presented well. I can use what I learned in daily life. Thank you, this evening helped provide ideas & resources. Janine did an excellent job presenting her topic. Comprehensive, clear, good interaction between instructor and students. Useful information & tips. You have motivated me to get focused and work on organizing my stuff. Thanks for a great class! Organized material covered very well. 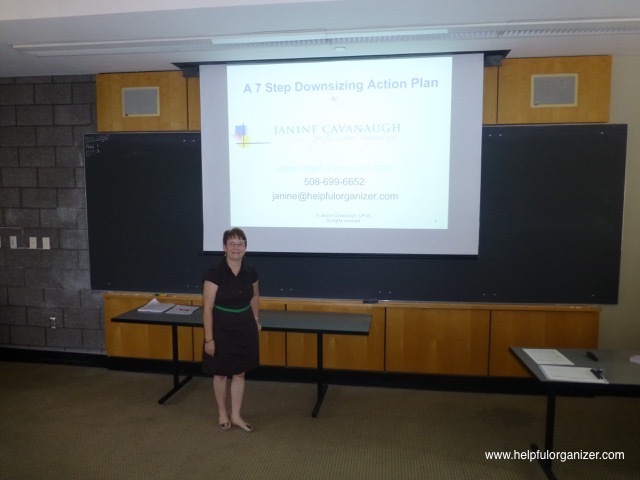 Thank you for your classes, the insight, and the many options and strategies for downsizing and reducing clutter. Speaker had some solid tips. Good speaker. Nice presentation, Janine. I knew you’d pull it off without modern day technology. You are so good at what you do. We couldn’t help but learn something from you. Interested in attending an organizing class? Please look under Upcoming Classes & Events and contact the class location directly. Looking for more details or interested in booking a confidential organizing consultation?